"In more than one case a Vietcong suspect has been towed after interrogation behind an armored personnel carrier... This always results in death in one of it's most painful forms." - Malcom Browne, in The New Face of War. The photograph used in this alternative ad for the movie "We Were Soldiers", was taken by Photographer Kyoichi Sawada of United Press International(UPI). The infamous photo shows U.S. 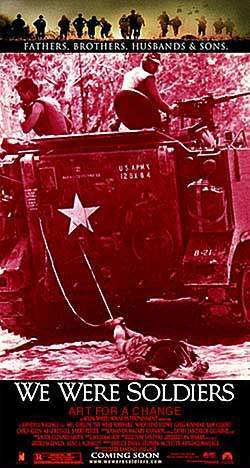 Troops with a Vietnamese man tied to, and being dragged behind, an American armored personnel carrier. The photo comes from the 1966 book by Felix Greene, VIETNAM - VIETNAM, which is now out of print. Original: "WE WERE SOLDIERS", ALTERNATIVE POSTER.